I guess I don’t understand editorial pages. The laws of physics must be different there. As global levels of sea ice declined last year, many experts said this was evidence of man-made global warming. Since September, however, the increase in sea ice has been the fastest change, either up or down, since 1979, when satellite record-keeping began. According to the University of Illinois’ Arctic Climate Research Center, global sea ice levels now equal those of 1979. These are statements about facts–both the grainy little facts of data, and the larger facts they add up to about how the world works. Are these facts correct? As I wrote on Monday, that question would have been answered if Will was writing for a science magazine like Discover (or the New Yorker, or many others). A good fact-checker would burrow into the column and demand confirmation of everything in there–typically by reading over all the relevant material and calling up the sources. I later contacted Bill Chapman, who runs the center, to ask about the statement. He explained that he and his colleagues got somewhere between 80 and 100 from people coming to the center’s web site to see for themselves how the ice was the same, and finding that there was a lot less ice than George Will had said. Of course, they probably assumed that by “now,” Will had mean “now,” as opposed to “two months ago.” Silly readers. The ice was not the only subject of errors in Will’s piece. Brad Johnson of Wonk Room, among others, has come up with a list of other items–a lot for a column just a few hundred words long. But that sharp reply from the Arctic Climate Research Center made the ice the focus of many complaints that came to the Washington Post. the Post has a multi-layer editing process and checks facts to the fullest extent possible. In this instance, George Will’s column was checked by people he personally employs, as well as two editors at the Washington Post Writers Group, which syndicates Will; our op-ed page editor; and two copy editors. How had this information about the ice slipped through the dense fact-checking mesh? The ombudsman did not cite a call to anyone at the research center. As I later discovered, nobody–not Will, not his employees, not the two editors at the Washington Post Writers Group, not the op-ed page editor, not the two copy editors–actually got in touch with the scientists at the center. Instead, they relied on a statement that had been posted on the center’s web site in January. That January statement has a backstory of its own. So–on the level of grain-sized facts, Will could have said, with accuracy, that on one day in December 2008, the global ice area was near or slightly lower than it was on that day in December 1979. He did not. I leave readers to ponder why he didn’t. It doesn’t quite have the same ring as the original. Of course, the big difference between February 2009 and February 1979 does not, on its own, mean that the world’s ice is on a fast track to oblivion, no more than picking a single day in December means there has been no change. Climate change happens over years and over decades, with noisy jumps at smaller scales. And to understand how climate change is affecting the ice, climate scientists actually consider what the latest climate models predict about how that ice will change. In his column, Will claims that many experts were warning in 2008 that the drop in global ice areas was evidence of man-made warming. He doesn’t tell us who those experts are. And, in fact, the research center scientists wrote in their January statement that global ice area may not be relevant as an indication of climate change. Why? Because almost climate change models project shrinking Arctic ice, but not necessarily Antarctic ice. In fact, some recent models show extra evaporation due to warming leading to snow falling on the sea ice around Antarctica. And if you look at the ice at each pole, the ice in the Arctic has been on a shrinking trend. The ice around the Antarctic has had a reverse trend as is actually covering a bigger area this year than in 1979. This is consistent with the climate models. All of this was in that January statement. It’s one page long. If the Washington Post’s batallion of fact-checkers actually used this to approve Will’s statement about the area of ice, they had to have seen this additional information. But they did not bother to raise an objection. All the attention Will has been getting–or at least an article that discusses his column in the New York Times–seems to have gotten under his skin. In his column today for the Washington Post, he has returned to global warming, and to his own previous column on the subject. The challenge he’s referring to is about the ice. Will does not mention the many other challenges that have been laid out. But let’s leave them aside. Life is short. What does Will have to say now about the ice? Citing data as interpreted by a blog…That’s some fine reporting. Neither George Will nor his employees did any more research than look at a blog. Now, blogs can be wonderful, but would it have been really so hard for Will and Co. to drop a note to the scientists themselves to do their own research? Pick up the phone? Apparently not. Will then uses that same January statement from the scientists in response to that blog post as evidence that he was right. But on Feb. 15, the Sunday the column appeared, the center, then receiving many e-mail inquiries, issued a statement saying ‘we do not know where George Will is getting his information.’ The answer was: From the center, via Daily Tech. Consult the center’s Web site where, on Jan. 12, the center posted the confirmation of the data (http://arctic.atmos.uiuc.edu/cryosphere/global.sea.ice.area.pdf) that this column subsequently reported accurately. See anything missing here? How about the fact that by the time Will published his column, there was a lot less ice than there was 30 years ago? How about the point made in that same statement Will prizes so greatly that global ice is a red herring? But Will can’t leave it at that. 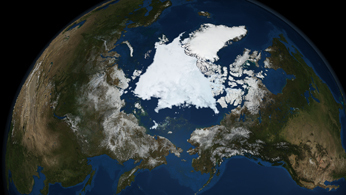 On Feb. 18 the U.S. National Snow and Ice Data Center reported that from early January until the middle of this month, a defective performance by satellite monitors that measure sea ice caused an underestimation of the extent of Arctic sea ice by 193,000 square miles, which is approximately the size of California. Will ends his column by complaining that the New York Times isn’t reporting on that story. But Will hasn’t told the story accurately. First of all, the trouble with the satellite has not affected the information coming from the Arctic Climate Research Center. As I wrote earlier this week, the scientists there use their own methods to calculate sea ice area that are different from the National Snow and Ice Data Center. And by cross-checking with other satellite measurements, they found that their estimates were still good. Meanwhile, the National Snow and Ice Data Center scientists began to look at the readings from another sensor on the same satellite. They recalculated the ice area for the past few months. And on February 26, they were back in business, publishing their corrected measurements, which include the period when they had been underestimating the ice. The temporary error in the near-real-time data does not change the conclusion that Arctic sea ice extent has been declining for the past three decades. In trying to justify an old error, Will can’t help making new ones. But at this point, I’m not expecting any corrections.